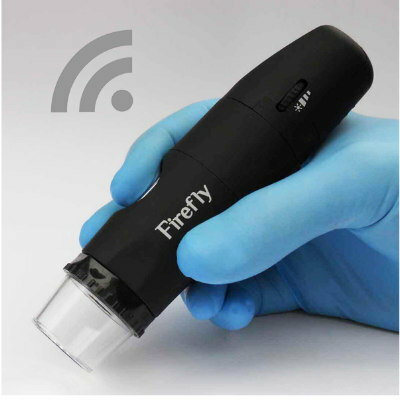 Firefly is a provider of wireless portable microscopes and magnifying cameras with real-time 30FPS video transmission. Its wide variety of wired and wireless cameras as well as accessories are used by professionals from different industries including audiology, ENT, primary care, pediatrics, telemedicine, and dermatology among others. The DE350 wireless polarizing dermatoscope (dermascope) is a special purpose digital video camera combined with a high magnification polarizing lens and multiple ultra-bright LEDs. Powered by 15x optical magnification, it streams high quality live video (at 30fps) to a computer, enabling the user to view and record images or videos.